That’s what Seattle is getting after the City Council voted unanimously Monday to approve some of the most sweeping zoning changes in the city’s recent history. Getting there took a number of years, as the policy was subjected to community conversations, analysis and legal wrangling. During that time, Seattle witnessed a record-breaking boom. The council’s vote will allow denser construction in and around 27 neighborhood hubs while requiring developers in those areas to contribute to affordable housing by including low-income apartments in their buildings or by paying fees. The changes adopted for neighborhoods from Licton Springs to Eastlake and the Central District to Rainier Beach were pitched as a response to rapid population growth and a widening wealth gap. More housing options will be allowed on about 6 percent of Seattle blocks now reserved for single-family houses, though most of the city’s residential land will for now remain off limits to apartments. “Planning for growth means sharing space to make room for everyone who wants to find their place in Seattle,” said Councilmember Rob Johnson, who shepherded the changes through the council. Councilmember M. Lorena González said the upzones will “begin the process of dismantling exclusionary zoning laws historically rooted in the intention to exclude people who look like me” from certain blocks. The plan to harness private construction to help create thousands of units of low-income housing while making Seattle more urban won support from some developers, nonprofit housing providers, unions, environmentalists and density advocates. Many other cities have such policies. Seattle until recently only had voluntary programs. 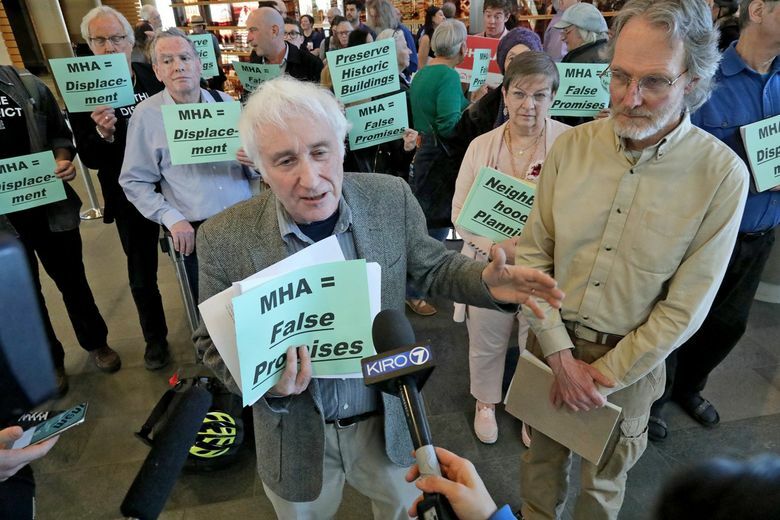 Critics said the city should have dealt with each neighborhood separately and described the Mandatory Housing Affordability (MHA) upzones as a sweetheart deal for developers, warning the plan would accelerate the replacement of older, relatively cheaper dwellings with more costly models. They argued against allowing developers to pay fees in lieu of including affordable apartments in new buildings. Monday’s changes will require developers to devote 5 percent to 11 percent of their projects to low-income apartments or pay $5 to $32.75 per square foot in fees, depending on where they build and how much heights increase there. The requirements will apply whether or not developers build up to the maximum height and density allowed. Seattle officials have estimated the neighborhood upzones will generate as many as 3,000 low-income apartments across Seattle over 10 years. Councilmember Sally Bagshaw called that “a very important drop in the bucket” and Councilmember Kshama Sawant called it “better than nothing.” What the city truly needs is rent control, Sawant said, arguing against supply-side solutions. Councilmember Lisa Herbold is pushing a proposal that would require developers who raze relatively inexpensive homes to go above and beyond the MHA policy by replacing them with low-income units or by paying more in fees. “Today, Seattle took a big step toward more affordable housing choices,” Mayor Jenny Durkan said in a statement. Along with the upzone legislation, the council passed a resolution that commits the city to consider other steps, such as policies to monitor and combat the displacement of marginalized communities and to protect exceptional trees and historic buildings. Monday’s vote was the culmination of more than four years of discussions that began when then-Mayor Ed Murray convened a blue-ribbon panel to address the city’s growth and housing problems, including rent and home-price increases. The University District and blocks in and around downtown Seattle saw MHA upzones in 2017, so the affordable-housing requirements will apply wherever new multifamily buildings and commercial buildings are constructed. The 2017 upzones are expected to yield an additional 3,000 low-income apartments over 10 years. But arguments about Seattle’s zoning are hardly over. Neighborhood-association activists who delayed the upzones for several month with an unsuccessful legal challenge against the city’s environmental analysis said Monday they may now appeal the plan to the state’s Growth Management Hearings Board. Meanwhile, a debate over the rest of Seattle’s residential blocks could start as soon as this year’s council races, pitting voters who want denser options on blocks now reserved for single-family houses against those who want to halt what they describe as a “top-down” approach to growth. “I think that is the next conversation to have,” said Councilmember Teresa Mosqueda, who supports more changes, partly to address Seattle’s history of racial segregation.